Do you currently use Chiropractic software? Like every healthcare provider, chiropractors are in the midst of shifting their medical record systems from paper to digital form. 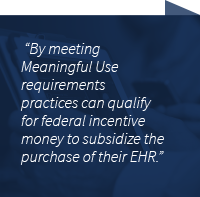 Choosing the best chiropractic software provider can be a complex process, especially if practices are looking to meet Meaningful Use requirements and qualify for federal incentive money to subsidize the purchase of their EHR. Luckily, this guide outlines the most important features and considerations for DCs who are selecting a chiropractic EHR. A key distinction between EHRs geared toward specialists and those that service internists and primary care physicians is the use of specialty-specific templates. Most chiropractic software will come loaded with templates that fit the specialty’s workflow. These products aren’t the only options available though, and may not be the best option for every practice. Why? Because usability plays a significant role in workflow as well. A specialty-specific EHR may feature the right templates, but the interface may be complicated and unwieldy. Many larger vendors also offer chiropractic products, which feature templates for DCs as well as the ability to customize templates to fit different workflows. Considering the customization ability of templates is an excellent way to narrow the wide array of EHR products. To comply with Meaningful Use’s quality standards, it’s important to choose a platform that can incorporate surveys for measuring pain and function in patients. Many of these surveys have been the industry and scientific standard for some time, but the information they gather must be collected and reported as part of the chiropractic quality standards. Consequently, an acceptable EHR must be able to translate the data from a formed filled out in the patient portal – or in the office – and incorporate it into a patient’s record. The two forms require different approaches, as digital form can be directly submitted into a patient portal and EHR, while a survey, while a survey filled out in the office will need to be scanned into the records system as an image. CMS actually has two different requirements for surveys, referred to in the measurement literature as standard measurement tools. Meaningful Use requirements include quality measures for pain assessment and follow-up as well as quality measures for assessing functional outcome. Pain assessment and functional outcome may have distinctions, but some surveys overlap, including the Oswestry Disability Index (ODI), and the RAND SF-36. Not only does gathering this data help DCs qualify for Meaningful Use incentives, it also allows practices to increase reimbursement by reducing claims denial from payers. Integration with pre-existing systems is important for any electronic medical record system, because clinical information will need to be pulled from diagnostic imaging systems and used for billing and practice management systems. Integration with diagnostic imaging systems is particularly important for chiropractors given the central use of x-rays, MRIs, and other imaging in this specialty. This type of integration between EHRs and medical devices has traditionally been difficult since the two systems are owned by different companies and run disparate software. However, Meaningful Use is again pushing EHRs to integrate with imaging software. 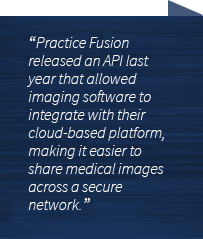 For example, Practice Fusion released an API last year that allowed imaging software to integrate with their cloud-based platform, making it easier to share medical images across a secure network. Practice management and medical billing software are the other major systems DCs should consider integrating their EHRs with. Both are becoming less common as standalone platforms, as the scheduling and patient intake features of practice management systems are increasingly being offered as part of electronic medical record systems. Similarly, billing software is often outsourced to a third party, but can still be used as a standalone platform. Practice management and billing systems were already common before EHRs became a standard, so there will likely be a number of instances where a practice already has a PM system that needs to share information with a new EHR. Which Chiropractic software is right for your practice? Highly sought after in some circles and treated skeptically in others, voice recognition software can help DCs cut down on charting time by acting as a note dictation mechanism. The benefit is obvious: less writing equals less time spent filling out patient charts. However, using voice dictation can be tricky if the software relies on natural language processing to translate the dictated notes directly to text as these programs still linger at around 90-95 percent accuracy. A more common tactic is to have a transcriptionist convert the voice notes into written form and then enter the information into the EHR. This saves the provider time, but can be costly. Certain platforms will have specific tracking measures for Meaningful Use, like Backchart’s Meaningful Use dashboard. These indicators help you calculate how well you’ve performed as measured against the federal government’s incentive program. A Meaningful Use report also helps DCs see the information they’ve collected and the information they’ve missed, though Backchart makes it simple for DCs to collect the requisite information throughout the course of their normal workflow. Not all solutions will feature the same level of Meaningful Use tracking that Backchart does, and having a Meaningful Use tracking software inside the EHR may not be a strong selling point for all chiropractors. However, if you’d like to qualify for the $44,000 that Meaningful Use offers on an annual basis, such dedicated features make it easier. There are two types of notable certifications for electronic medical records, both supported by the federal government: The Certification Commission for Health Information Technology (CCHIT) and the Office of the National Coordinator for Health Information’s ONC-ATCB certification. The ONC-ATCB certification is traditionally viewed as less stringent as it only focuses on an EHR’s ability to meet Meaningful Use criteria. In contrast, the CCHIT certification tests the capability of the EHR software to meet the minimum standards, and also to perform up to the promises made by vendors. However, due to the increased requirements of Meaningful Use stage 2 the number of ONC-ATCB certified products has reduced significantly. When choosing an EHR product – regardless of whether Meaningful Use is a priority – either certification represents a definite standard that DCs can use to determine the overall quality of the platform. Referring to the IT infrastructure of an electronic medical record system, this choice is an important one for DCs. In cloud-based systems, the EHR vendor hosts the software offsite on their own servers, and the practice accesses the system through the Web. This model saves money up front, because the practice doesn’t have to buy a lot of new hardware or deal with upgrades on their own. Upgrades are included in the contract, and as mentioned before, the server is located in a server farm that the EHR vendor owns. An on-premise model is more expensive up front, but may be cheaper in the long-run. Cloud EHRs are paid for on a subscription model, a payment method that can actually end up being more expensive depending on how long you keep the system. However, cloud systems are known for their ease of implementation, and may result in less workflow disruption. To meet Meaningful Use Stage 2, more than five percent of a practice’s patients must access their health information online. Patient portals are the means by which patients access this information. Many EHRs feature built in patient portals, but a significant number do not. Third party patient portals that can integrate with multiple EHRs also exist, though they are becoming less popular as physicians look to juggle less vendor relationships and purchase integrated platforms.